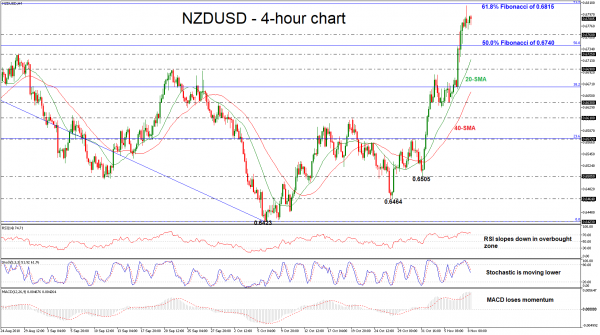 NZDUSD has been in a flying mode over the last six days after the rebound on the 0.6505 support level. The rally brought the price even higher, creating a strong upside correction mode, reaching a new three-month high around the 61.8% Fibonacci retracement level of the downleg from 0.7060 to 0.6423, at 0.6812. Looking at 4-hour oscillators though, there are signs that the latest rebound may be over, and a bearish move is possible. The RSI turned marginally down after it reached the overbought area, while the MACD, although above both its zero and trigger lines, shows signs of topping as well. Also, the stochastic is moving lower. Currently, the price is trading slightly lower and the next stop could come at the 0.6760 support level. A clear dip below this barrier could send prices towards the 50.0% Fibonacci of 0.6740, while slightly below, the 0.6725 level holds as well, taken from the peak on August 28. If the bulls continue to have the upper hand, the price could actually challenge the 61.8% Fibonacci region of 0.6815 and then the expectation is a touch of 0.6850, identified by the high on July 26. Overall, NZDUSD posted a sharp upside movement but indicators signal a bearish retracement for the next few sessions.